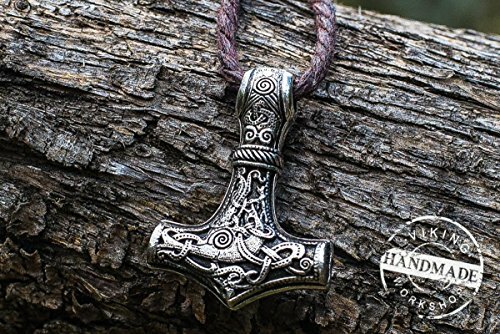 This is a Viking Amulet Necklace Scandinavian Norse Jewelry. This pendant made using 925 silver and this pendant has the following dimensions: Weight: approx 11 g, Size: 30 x 22 x 6 mm and Hole size: 3,5 mm. This pendant also can be made using high quality .585 gold. Please contact us if you need to place a custom order. This is stylization of Thor's Hammer with ornaments from little village Mammen, Jutland. Hammer contains floral ornament and a bird. Also available same model in bronze. Mjölnir is depicted in Norse mythology as one of the most fearsome weapons, capable of leveling mountains.